My name is Rae and I am the Pastry Chef at Boxcar. I’ve been in the kitchen and working in bakeries for as long as I can remember. It has always been a hobby of mine, but I had never intended on it becoming a career. I graduated from SUNY Brockport with a Bachelor’s in Environmental Science, and after working in the industry for a few years, I kept finding myself wanting to go back to what I truly enjoyed. Since then I have worked in both big industry chains and small family owned bakeries. My specialty is with cakes, cupcakes and cookies but I have never been one to shy away from a challenge, so when John Ebel, owner of Glen Edith approached me to start a donut shop with him I knew this would be a great opportunity for me to grow as a baker. Since I had never made a donut before, it was definitely a learning process. I researched and developed a dough over the course of a few months. When ready, we trialed them in the kitchen and put them out for the customers to try at Glen Edith and gathered their feedback. After going through 4 or 5 different variations for our dough, we finally landed our signature dough and we couldn’t be happier with the texture and flavor that we have today. I started making four new flavors every week and we had sold them at both of the Glen Edith locations. After getting our name out there, we were finally ready to open our first brick and mortar on 127 Railroad St on May 20. Since then, the donuts have been flying off the racks and I couldn’t be happier with the response we have gotten. Once you’ve got the science down the process is simple, but it takes a lot of time to develop the light, airy, and chewy texture that everyone desires in a donut. First, we make the donuts in small batches to ensure freshness and that our dough does not over-proof. We begin to mix the dough, blending all of our ingredients together. Next, we let the dough proof until it has doubled in size. Afterwards, we roll and hand-cut the desired shape. At Boxcar we make filled rounds, bars, and of course the classic ring. Then we proof the dough a second time, waiting for it to double in size yet again. Once this process is complete, the dough gets a quick, warm bath in oil until they are a golden brown. Last comes the fillings and decorations, completing the perfect donut to indulge your cravings. 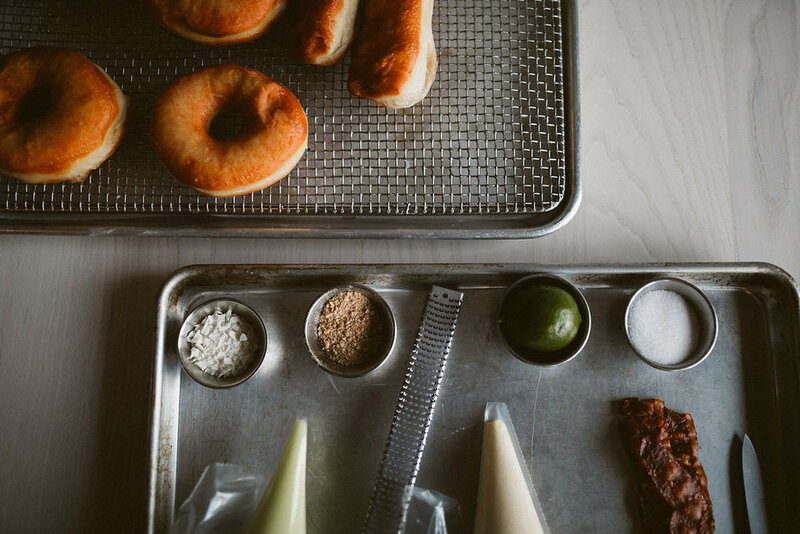 At Boxcar, we fry about 2,000 donuts to appease the Saturday morning crowd. All the donuts are hand-cut and made fresh every day, which means our work day starts around 10 PM Friday night so that they are ready to serve to our customers by 7 AM when we open the doors Saturday morning. For this day alone, we go through 200lbs of flour and 150lbs of powdered sugar. Serving the community is an amazing experience and I love to hear everyone’s feedback on what I’ve come up with for the week. Creating and experimenting with new flavors is by far my favorite part of them job. It’s challenging, but very rewarding when you see the racks of donuts selling out. My vision for the future is to get a little crazy with the flavors we have to offer; I want to provide something that people may have never had before in a donut. We introduce three to four new flavors every Tuesday and carry them throughout Sunday, offering two vegan options per week as well. We want to be able to serve a wide variety of people and with that we understand there are some dietary restrictions, so we are currently developing a gluten free option too, so stay tuned. Our flavors will be ever changing and favorites will be rotated through the lineup so if you find something you love, it doesn’t mean it’s gone forever. Overall this process has been amazing, and the amount of support we have gotten has been overwhelming. 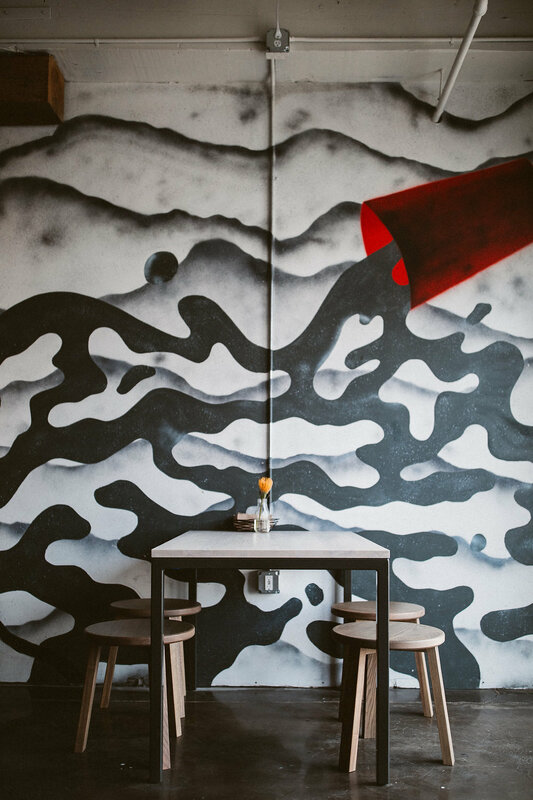 I’m so excited to serve Rochester and provide people donuts that they want to talk about, so make sure you stop in and say hi and of course, eat at Boxcar!